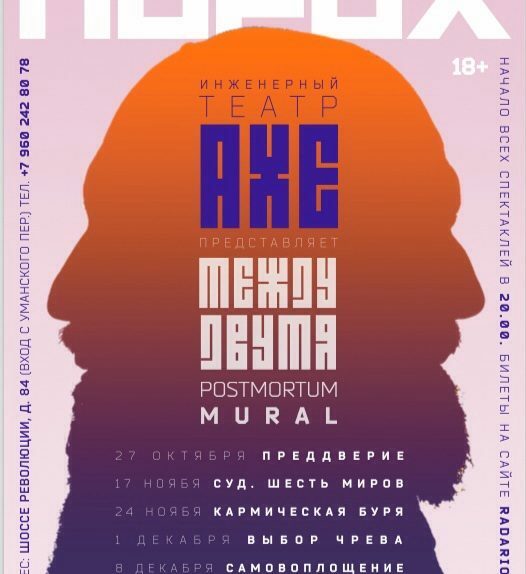 From October 27 to December 15, 2018, in the space of the theatrical platform «POROKH» the Engineering Theatre AKHE will show all 6 episodes of the postmortum mural based on «The Tibetan Book of the Dead». – between Pavel Semchenko and Maxim Isaev. This is a world where the Sign and the Thing are equal. «POROKH». AKHE. Engineering poetry in action. Beginning at 20:00. Address: St. Petersburg, sh. Revolution, 84 (entrance from Umanskiy alley). More information: +7 960 242-80-78. Previous Previous post: AKHE in Scotland!